The following are posts from The Animal Legal Defense Fund for Tony. Our sincerest thanks to ALDF for representing Tony and for their tenacious efforts in fighting for Tony’s relocation to an accredited reputable big cat sanctuary. Update: January 24, 2013 by Animal Legal Defense Fund: On Tuesday, February 19, 2013 the courts will hear ALDF’s oral arguments in the appeal to free Tony. August 29, 2011: This morning, the Louisiana Court of Appeals ruled that Michael Sandlin and the Tiger Truck Stop are necessary parties to the Animal Legal Defense Fund’s lawsuit to free Tony the tiger and ordered a new trial in the case. In so ruling, the Court vacated the permanent injunction issued by the trial court that would have freed Tony in December. The decision means ALDF will need to amend its complaint to add the new defendants, then re-do the litigation thus far. While we disagree with the Court of Appeals’ ruling, this is just a minor set-back. We are confident that the trial court got the law right the first time around and will rule the same way when we go through it again with Mr. Sandlin and the Tiger Truck Stop as parties. August 15, 2011: ALDF lawyers were in court today to defend against Sandlin’s attempt to get our case dismissed. In another victory for Tony, the judge denied Sandlin’s motion. This means the case will continue to move forward. The Court has set a hearing date of September 15 for ALDF’s motion for a mandatory injunction, which seeks an immediate revocation of Sandlin’s permit to keep Tony. July 19, 2011: The Animal Legal Defense Fund filed a motion for a mandatory injunction in June that would compel the Louisiana Department of Wildlife and Fisheries to revoke the current permit and seize Tony—meaning that Tony would not have to wait until December to experience his new life beyond the Tiger Truck Stop. Although this specific request was part of ALDF’s original complaint, the court did not rule on it at the hearing in May. A new hearing on the motion for a mandatory injunction was set for July 22, but has been postponed to a later date yet to be determined. Many animal welfare organizations were contacted in regard to Tony’s situation, and we are grateful to ALDF who responded and supported the efforts to relocate Tony to a big cat sanctuary. Thank you ALDF for your support of Tony and for the time and research dedicated to Tony. As the following email states, we look forward to your continued efforts in pursuing options in Tony’s case. Thank you so much for your concern for Tony the Tiger, and for contacting the Animal Legal Defense Fund. We were very disappointed to learn that the Louisiana Department of Wildlife and Fisheries granted a renewal of Michael Sandlin’s permit to keep Tony. Sandlin is the owner of the Tiger Truck Stop in Grosse Tete, La., where Tony is kept in unnatural confinement and is subjected to noise and diesel fumes 24 hours a day. In November, ALDF filed a petition with the Department of Wildlife and Fisheries, arguing that Sandlin’s permit is in violation of state and local ordinances. Rest assured that ALDF is continuing to investigate our legal options with regards to Tony’s case. Sign up for enews updates from ALDF: http://org2.democracyinaction.org/o/5154/signUp.jsp?key=16238049&Email to stay tuned on our ongoing work to free Tony. Baton Rouge, La. – This morning, the national non-profit Animal Legal Defense Fund (ALDF) filed a lawsuit against the Louisiana Department of Wildlife and Fisheries (LDWF) and its secretary Robert Barham, arguing that he violated state law in granting a permit allowing Michael Sandlin to exhibit a male Siberian-Bengal tiger named Tony at the Tiger Truck Stop in Grosse Tete, La. Tony has been on exhibit at the truck stop since 2000; he has lived there with no other tiger companions since 2003. Joining ALDF as a co-plaintiff in the case is former Louisiana Representative Warren Triche, who authored the state’s law which led to the ban on the private ownership of big exotic cats, including tigers. Two other Louisiana residents, also deeply concerned by Tony’s long-time suffering, are additional co-plaintiffs. The law offices of Baker, Donelson, Bearman, Caldwell, & Berkowitz, P.C. are providing pro bono assistance with the lawsuit. 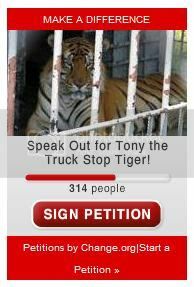 Why are attorneys and activists up in arms about Tony’s tenure at the Tiger Truck Stop? In addition to being subjected to noise and diesel fumes 24-hours a day, Tony is also frequently harassed and taunted by visitors at the truck stop. His enclosure is devoid of adequate enrichment, such as logs, trees, or complex vegetation that would allow him to engage in natural tiger behaviors. He has no pool of water large enough to allow him to submerge himself to cool off in the blazing heat of the summer. As a result of the stress of his confinement, Tony constantly paces on the hard concrete surface of his enclosure, putting him at risk for dangerous and painful veterinary conditions. Sandlin, the owner of Tony and the truck stop, has been cited by the USDA due to violations of the Animal Welfare Act, including a lack of proper sanitation and improper feeding practices. ALDF’s lawsuit argues that Sandlin’s existing permit for Tony, which Barham renewed in December 2010, violates Louisiana’s Act 715, a law sponsored by Triche and passed unanimously in 2006, and its implementing regulations, which ban the private possession of big exotic cats, including tigers. The complaint asks the court to invalidate the permit. Copies of the lawsuit and photographs of Tony at the Tiger Truck Stop are available upon request. ALDF was founded in 1979 with the unique mission of protecting the lives and advancing the interests of animals through the legal system. For more information, please visit www.aldf.org. Kristin Bauer, the actress who portrays the lovely-but-lethal vampire Pam on HBO’s award-winning True Blood, has teamed with the Animal Legal Defense Fund in the fight to free Tony, a Siberian-Bengal tiger who has been living in isolation as a “tourist attraction” at the Tiger Truck Stop in Grosse Tete, Louisiana for the past decade. Like Tony, “Pam” is a denizen of Louisiana (the hit horror drama takes place in the fictional town of Bon Temps) and a beautiful hunter of the night. In real life, Kristin is a long-time animal advocate who is biting mad over Tony’s cruel confinement. Award-winning actor and activist Leonardo DiCaprio is the latest high-profile supporter to join the Animal Legal Defense Fund’s campaign to free Tony the tiger, who has spent the last decade at Louisiana’s Tiger Truck Stop. On May 5, ALDF will square off against the Louisiana Department of Wildlife and Fisheries in East Baton Rouge District Court over the legality of a permit that allows Tony, a ten-year old Siberian-Bengal tiger, to be confined as a roadside exhibit at the Tiger Truck Stop in Grosse Tete, La. ALDF is arguing that the Department violated state law in granting the permit to Tony’s owner, Michael Sandlin. Sign the petition to help free Tony today! And stay tuned all next week for updates on Tony’s case! Join the Animal Legal Defense Fund in urging the Louisiana Department of Wildlife and Fisheries to revoke the permit that allows Michael Sandlin to display Tony, a ten-year-old Siberian-Bengal tiger, at the Tiger Truck Stop in Grosse Tete, Louisiana, where he has lived with no other tiger companions since 2003. On April 11, 2011, ALDF filed a lawsuit against the Louisiana Department of Wildlife and Fisheries and its secretary Robert Barham, arguing that he violated state law in granting a permit allowing Sandlin to exhibit Tony at the Tiger Truck Stop. I join the Animal Legal Defense Fund in urging the Louisiana Department of Wildlife and Fisheries to revoke the permit that allows Michael Sandlin to display Tony, a ten-year-old Siberian-Bengal tiger, at the Tiger Truck Stop in Grosse Tete, Louisiana, where he has lived with no other tiger companions since 2003. Tony has spent every day and night of the last decade at the Tiger Truck Stop, where he is subjected to the stench of fuel and the deafening noise of diesel engines 24-hours a day. What’s more, Tony is frequently harassed and taunted by visitors at the truck stop. His enclosure is devoid of adequate enrichment, such as logs, trees, or complex vegetation that would allow him to engage in natural tiger behaviors. He has no pool of water large enough to allow him to submerge himself to cool off in the blazing heat of the summer. As a result of the stress of confinement, Tony constantly paces on the hard concrete surface of his enclosure, putting him at risk for dangerous and painful veterinary conditions. Tony’s confinement is clearly inhumane — and, as the Animal Legal Defense Fund is now arguing in court, it is also illegal, as your Department violated state law in granting Michael Sandlin’s permit. Please follow the regulations already set by the State of Louisiana to protect members of the public and tigers such as Tony by revoking Sandlin’s permit immediately. ALDF Goes to Court for Tony the Truck Stop Tiger This Week! It’s time to take action! The Animal Legal Defense Fund is delivering petition signatures to the Louisiana Department of Wildlife and Fisheries this week when we fight for Tony’s freedom in East Baton Rouge District Court on Thursday, May 5th. This is your last chance before the hearing to join the over 27,000 people who have already signed the petition in ALDF’s fight to get Tony moved to a reputable and humane big cat sanctuary, where he can live out his natural life free of the fumes, toxins, and noise that make his current life so miserable. Baton Rouge, La. – Tomorrow morning, the Animal Legal Defense Fund (ALDF) and outraged Louisiana residents will square off against the Louisiana Department of Wildlife and Fisheries in East Baton Rouge District Court over the legality of a permit that allows Tony, a ten-year old Siberian-Bengal tiger, to be confined as a roadside exhibit at the Tiger Truck Stop in Grosse Tete, La. In its lawsuit, filed on April 11, ALDF argues that the Department violated state law in granting the permit to Tony’s owner, Michael Sandlin. During Thursday’s hearing, the court will hear ALDF’s argument that Sandlin’s permit to own and display Tony should be invalidated, and that Tony should be released into the custody of ALDF or an accredited animal sanctuary, where he can receive care and treatment and live out his life in a more natural environment, free from the 24-hour exposure to noise and diesel fumes. The court may choose to issue a decision in the case immediately following the hearing. ALDF’s lawsuit to free Tony has drawn the support of high profile advocates like Leonardo DiCaprio and True Blood’s Kristin Bauer and has galvanized activists around the world. This week, ALDF delivered to the Department of Wildlife and Fisheries over 31,000 signed petitions urging it to revoke Sandlin’s permit to keep Tony. Tony has been on exhibit at the Tiger Truck Stop since 2000; he has lived there with no other tiger companions since 2003. Joining ALDF as a co-plaintiff in the case is former Louisiana Representative Warren Triche, who authored the state’s law that led to the ban on the private ownership of big cats, including tigers. Two other Louisiana residents, also deeply concerned by Tony’s long-time suffering, are additional co-plaintiffs. The law offices of Baker, Donelson, Bearman, Caldwell, & Berkowitz, P.C. are providing pro bono assistance with the lawsuit. Copies of the lawsuit and photographs of Tony at the Tiger Truck Stop are available upon request. An attorney for ALDF will be attending the hearing and available for interviews. Reporters attending the hearing should arrive in advance, as it is scheduled to begin at 9:00 a.m. sharp. Kristin Bauer, the actress who portrays the lovely-but-lethal vampire Pam on HBO’s award-winning True Blood, recently teamed with the Animal Legal Defense Fund in the fight to free Tony, a Siberian-Bengal tiger who has been living in isolation as a “tourist attraction” at the Tiger Truck Stop in Grosse Tete, Louisiana for the past decade. In her video message, she describes what makes Tony’s current life so miserable and urges people to take action. ALDF is going to court for Tony tomorrow! 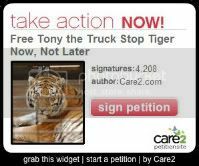 Join the over 28,000 people who have already signed our petition to the Louisiana Department of Wildlife and Fisheries, urging them to revoke the permit that allows Tony to be displayed as a roadside spectacle at the Tiger Truck Stop. In the wake of ALDF’s recent victory in the Tony the truck stop tiger case, we’ve received a lot of questions about the ruling. ALDF staff attorney Matthew Liebman answers some of these questions. Q: Why does Tony have to wait until December before he can leave the Tiger Truck Stop? A: Michael Sandlin’s current permit is valid until December 2011. The court enjoined the Department of Wildlife and Fisheries from issuing Mr. Sandlin a new permit when the current one expires. Although ALDF argued that the court had the authority and the obligation to order the Department to immediately revoke the permit, the court disagreed. The court directed the agency not to issue a new permit, but the current permit will stay valid until it expires in December. Q: Is there anything that can be done to get Tony released sooner? A: ALDF is looking at all of its legal options to determine whether further litigation could change the timeframe for Tony’s release. In the meantime, we’re encouraging our supporters to sign our petition urging the Department to revoke Mr. Sandlin’s permit. Even though the court refused to order the Department to revoke the current permit, the Department retains the authority to do so on its own if it chooses. Q: Where will Tony go in December? A: Although ALDF asked for custody of Tony in our lawsuit, the court refused to award him to us. That means the decision of where Tony goes in December is out of our hands. But ALDF will do everything it can to recommend and promote Tony’s release to a reputable, established, and humane sanctuary that will meet all of Tony’s needs. Baton Rouge, La. – Tomorrow morning, the Animal Legal Defense Fund (ALDF) and outraged Louisiana residents return to East Baton Rouge District Court to square off against the owner of the Tiger Truck Stop in Grosse Tete, La., where Tony, a Siberian-Bengal tiger, has been confined as a roadside exhibit for over a decade. The same court granted ALDF’s original request for a permanent injunction in May 2011, a ruling that would have prevented the Louisiana Department of Wildlife and Fisheries from renewing in December the annual permit that allows Michael Sandlin, owner of the Tiger Truck Stop, to keep Tony on display. In August, the Louisiana Court of Appeals ruled that Michael Sandlin and the Tiger Truck Stop must be named as defendants in the lawsuit and ordered a new trial, vacating the trial court’s earlier decision. In addition to this new trial, the Court will consider a motion by the Department of Wildlife and Fisheries to contest the plaintiffs’ standing to bring the lawsuit to free Tony. Wednesday, November 2, 9:00 a.m. Since ALDF filed its original lawsuit in April 2011, it has argued that the Department violated state law in granting the permit to Michael Sandlin. In tomorrow’s hearing, the Court will again hear ALDF’s argument that Sandlin’s permit to own and display Tony should be invalidated, and that Tony should be released into the custody of ALDF or an accredited animal sanctuary where he can receive care and treatment and live out his life in a more natural environment, free from the 24-hour exposure to noise and diesel fumes and the taunts of visitors. ALDF is requesting both a permanent injunction, which would mean the state could not renew Sandlin’s permit in December, and a mandatory injunction, which would require that Sandlin’s current permit be revoked. The Court may choose to issue a decision in the case immediately following the hearing. Tony has been on exhibit at the Tiger Truck Stop since 2000; he has lived there with no other tiger companions since 2003. ALDF’s lawsuit to free Tony has drawn the support of high profile advocates like Leonardo DiCaprio and True Blood’s Kristin Bauer and has galvanized activists around the world. The law offices of Baker, Donelson, Bearman, Caldwell, & Berkowitz, P.C. are providing pro bono assistance with the lawsuit. November 2, 2011: Great news from Baton Rouge, where Judge Michael Caldwell has ruled in favor of the Animal Legal Defense Fund and Louisiana taxpayers in our lawsuit to free Tony the Tiger from the Tiger Truck Stop in Grosse Tete, Louisiana. What is Best for Tony the Tiger? Tony is an 11-year-old Siberian-Bengal tiger. For most of his life, he has lived in a cage at Tiger Truck Stop in Grosse Tete, Louisiana. He is a roadside attraction. The Animal Legal Defense Fund has sued to get Tony out of that cage. We hope that Tony can be sent to a sanctuary, where he can live out his life in a more natural environment. Last week, we won our lawsuit in the East Baton Rouge District Court. The judge ordered the Louisiana Department of Wildlife and Fisheries not to renew the annual permit that allows the truck stop to keep him in that cage, and ordered the Department to revoke the current permit. Michael Sandlin, owner of Tiger Truck Stop, thinks Tony should stay at the truck stop. He says that’s Tony’s home and that people like to come and see him. Many Americans view wild animals as “specimens” to be kept in a jar and brought out for us to gaze upon. 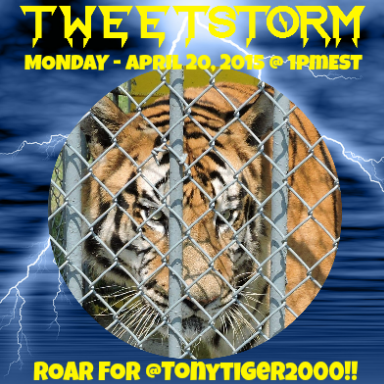 There is something inherently wrong with that assumption and, to the extent that we can get inside the mind of a wild tiger stuck in a cage in Louisiana, let’s look at this situation from the perspective of what’s best for Tony. This is worth repeating: in their natural habitat, tigers travel great distances to hunt and they avoid contact with human beings. In contrast, let’s take a look at Tony’s environment. Look closely at Tony. Do you notice the way he walks back and forth? That is called “stereotypic behavior,” repetitive or ritualistic movement, such as pacing or rocking. This is abnormal behavior; it is not the way Tony would act in his natural habitat and it is a sign that something is very wrong. According to experts, “(p)ossible explanations…include that carnivore pacing represents frustrated escape attempts (to forage, range, reach a mate, or for any one of a host of reasons)” or because species that usually roam over a wide range of land have been “rendered more dysfunctional by captivity…” “Stereotypic Animal Behaviour – Fundamentals and Applications for Welfare” (2nd ed.) – eds. Georgia Mason and Jeff Rushen (CABI, 2006). Tony is not a play-toy or a stuffed animal or large puppy hoping to get someone’s attention. He’s a tiger and he has been denied the basic right to be a tiger – a wild animal living and hunting according to his natural instincts in his native habitat. Can anyone seriously argue that a wild tiger wants to be spend his entire life stuck in a cage at a truck stop, inhaling gasoline fumes and having to be in close proximity to the human beings his instincts are telling him to run away from? Seriously? And, while we’re on the subject, there are thousands of other wild animals exploited in this way all over the U.S. Once again, if you look closely, there are visible signs telling us why wild animals should not be in captivity: the recent incident in Ohio, where dozens of wild animals were let loose by their owner and slaughtered by local police; Tyke, the elephant who broke loose after years of performing tricks in the circus. Tyke killed one person, injured several others and was thereafter killed on the streets of Honolulu; Travis, the “pet” chimpanzee in Connecticut who attacked a woman and badly mutilated her face; Tilikum, the captive orca (killer whale) at Orlando’s Sea World, who has killed three human beings so far. These are just a few of the incidents that serve as wake-up calls that wild animals have no place in captivity. Wild animals are being victimized every step of the way – by being removed from their native environments, by suffering in a life of captivity and, if they manage to escape, by being summarily killed. We want to do the right thing for Tony. He can no longer survive in the wild, but he can go to a reputable sanctuary and live his life with far more dignity and less stress. I urge public officials to stop ignoring the obvious and deal realistically with the problems caused by allowing individuals to keep wild animals in captivity: ban private ownership, sale, purchase, possession and custody of wild animals. 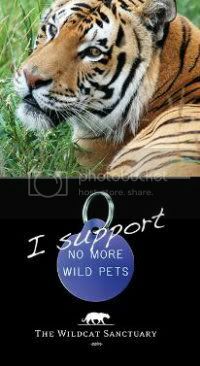 To find out what you can do to help Tony and others like him, visit: https://freetonythetiger.wordpress.com/.